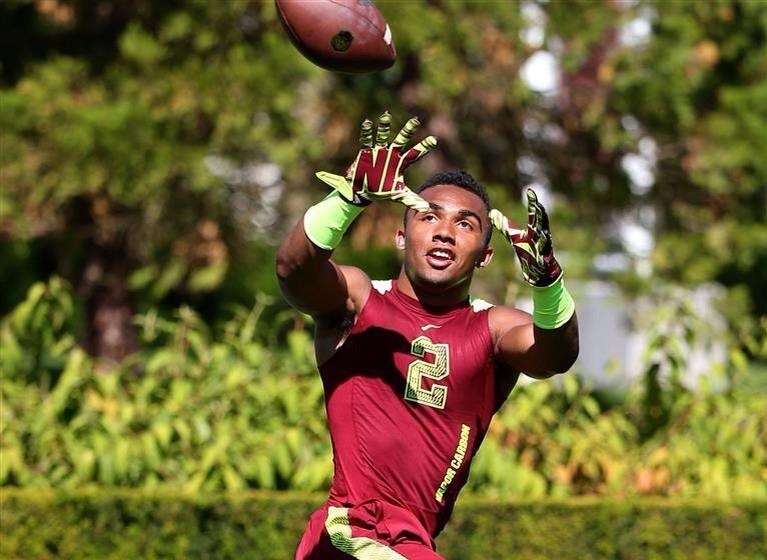 Christian Kirk has committed to A&M over Arizona State and Auburn. The 5-star wide receiver is 5’11” 190lbs. and is listed as the 3rd best receiver in the nation. From Arizona, Kirk has always expressed an interest in playing with fellow Arizona native Kyle Allen. When the 5-star quarterback committed to A&M this past February, the Aggies instantly became serious contenders in Kirk’s recruitment. And now that Allen is A&M’s starting quarterback, the Allen to Kirk connection looks to be more likely than ever. Kirk set the Arizona state record for career receiving yards with a total of 3,943. And with 203 catches and 52 touchdowns over his high school career, he is averaging 19.4 yards per catch and scoring a touchdown once every 4 receptions. The highly sought after receiver has an offer list larger than anyone I’ve ever seen. He took official visits to UCLA, Auburn, Texas A&M, and most recently Arizona State. The Aggies have the luxury of one of the youngest, deepest, and most talented receiving corps in the nation. With the likes of 5-star freshmen Ricky Seals-Jones and Speedy Noil in the starting lineup along with breakout sophomore Josh Reynolds, the future is very bright for years to come. However, the departure of senior Malcome Kennedy leaves a gaping hole to fill. Kirk is talented enough to step into the starting role as a true freshman and immediately make an impact.